Alas, poor Wolfgang, we knew him well… Maybe not, DID YOU SEE THE BAD’SS WAY HE DIED?!! I’m so going to use “Yippee! 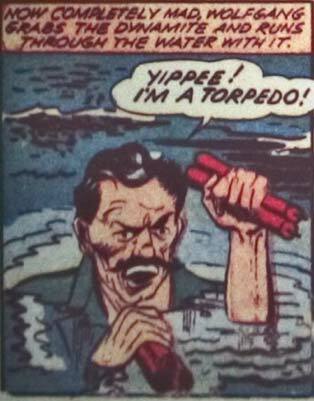 I’m a torpedo!” as my catchphrase when I become a supervillain. Um… Running through water? Have any of you really tried doing that? I think this guy has more superpowers than he’s letting on. When did Namor grow a moustache? Waiter! I’ll have one of what he had. And make it to go! Not until you’ve recieved your official Bulletman Collector’s piece Bulletman helmet for only 1 million bullet points.